Looking for a phone job from home that doesn't require a land line? You are not alone. So many of us are now relying on cell phones or Voip as our primary means of communication. Still, lots of WAH companies require that a land line be in place. I've done some searching around and found a few places that do not require a land line, although you'll notice they're primarily all outbound calling. Please keep in mind that not all of these companies will not necessarily be hiring right now. Also, be sure to verify before applying that you definitely don't need a land line because the companies listed might change their technical requirements at any time. NextWave@Home is a company similar to OnPoint Advocacy. No calls are made from a land line or a cell phone. You use their cloud-based software platform for making the calls. OnPoint, similar to NextWave mentioned above, also has their own system that you use for making the calls, so you don't need to worry about a land line. Intelichek allows you to use any sort of phone for making the calls, it does not have to be a land line. You work at home doing phone mystery shopping for this company. In addition to no problem with background noise, Yardi-Matrix is also OK with the use of any sort of phone for making the calls. You can use a cell phone, land line, or VOIP, whatever you have. You will have to call long distance though. This company hires you to call apartment complexes posing as an interested party and ask questions. It's seasonal work — they only hire a few times per year and the work only lasts for four to six weeks. Parameds allows you to use Skype or Google Voice for the calls. Working for this company involves medical records data retrieval/underwriting, and the calls are outbound. I contacted Maritz Research, and they responded saying that they definitely prefer a land line, but they do have some workers using Skype, Google Voice, and cell phones that have clear, stable connections and unlimited minutes. They don't want workers using Magic Jack because it isn't compatible with their automatic dialer. 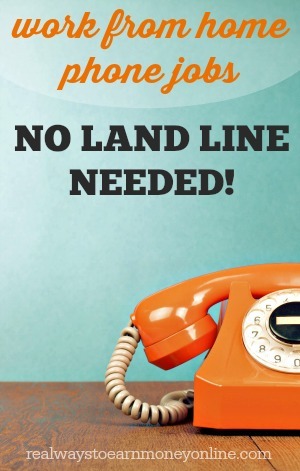 Sales agents for NexRep do not use land lines. The calls are routed through a computer. You do not have to use a land line to make healthcare mystery shopping calls for Perception Strategies. Any type of phone is fine, and they let me know that actually most of their workers use cell phones to place the calls. At Teletech, you can use either a land line or another type of Voip/digital phone as long as it does not connect to the internet in any way. So Skype, Magic Jack, Google Voice, etc. would be out, but another type of phone that doesn't connect to your internet is OK.
To work for TeleNetwork, you install a soft phone onto your computer, so no land line is needed. XACT does not require that their employees a land line. They actually use a type of Voip software for calls. This company hires people for inbound customer care, support, and outbound lead sales. Read our review of XACT here. Lifebushido hires work at home virtual assistants. You can use any type of phone, including Voip, a land line, or a cell phone as long as your call quality is good. I could not get a response from Convergys to confirm that they do not require a land line, but people who have worked for them claim one is not needed. This company does not appear to require a land line as it is not listed anywhere in their tech requirements. Enterprise typically hires in specific US states. You can check here to see what openings are currently available. Support hires remote tech support agents. They do not require a land line. All calls go through a USB headset. Pay is $11 and hour and up depending on your role. Some prior experience in tech support may be required. Go here for more details. Work at home doing cold calling. Pays $12 an hour and you have to commit to 20 hours per week. Calls are routed through your computer to a USB headset. Go here to apply. Outbound calling. Hires across the US. Pay is base plus commission. You do not need a land line phone. Go here to apply at Marketlink. Hires home-based sales call center reps in CO, IN, IL, and GA. You have to be able to install software that allows you to take calls through your computer. They will provide you with a headset to use. Go here to apply at Windy City Call Center. This company hires people to take inbound calls regarding health club and gym memberships. No land line is needed. They send you all the equipment you need to do the work. Go here to read more about ABC Financial. Sitel used to require a land line, but a reader commented below that she was just hired by them and was told that none of their projects require a land line now. Go here to read more about Sitel. One of my readers let me know in the comments that Sutherland is another company offering home-based jobs where no land line is needed. Go here to read my full review of Sutherland or here to check for openings. Getting a land line may still be a good idea. It's possible to get them pretty cheap with no features now, and you should also be able to write the cost of it off on your taxes as a work/business expense. If you find a work at home job that seems ideal for you but requires a land line, try checking around to see how much one would actually cost you before totally dismissing the idea of working for that company. It's also worth noting that with many companies, you won't be required to get a land line until after you've been hired. So it's still worth applying! You likely noticed that, while the above companies don't require a land line, most of them DO require a headset. You can use this list of work from home headsets to to check out recommended headsets for working from home. They vary in price from very cheap to very expensive, so you can most definitely get one that fits your budget. Looking For Lots More Legit Work From Home Jobs? Here are some things you should do (or do all 3!). I am completely new to all of this and would like to know what you would recommend to someone who is looking to start working from home. I do not have a land line and I have a MAC. Any and all information would be greatly appreciated!! HELP! After years of working inbound call centers, I really want to get work doing call center work from home, (since the last of the the centers in town has just relocated out of the USA). Besides finding a good employer to get started with, my biggest problem is NOISE REDUCTION on my headset! I live on a busy street, and even with the windows shut, I can still pick up some passing vehicles (and an occasional fire truck) on my USB headset. Is there any inexpensive noise reduction/noise cancellation software for Windows 7 (64 bit) that can help cancel that street noise out? What do experienced WAH call center workers recommend? Technology is truly amazing. Now, you can work from home and practically talk to the world without worrying about long-distance charges. Voice Over Internet Protocol and other such tech now allow you to do this. Very cool. Hello, fellow job seekers! My name is Rayvan. I am a 23 year old single mother of 3 who recently has ti move back home to mom!! We stay out in the country and don’t own a landline. Needless to say that is very unfortunate for me, but to add onto that, we di not have any type of pc or laptop!! All i have is my cell phone! I am in desperate need of a job so i can get back on my feet!! If anyone knows of any online jobs that will allow me to work from my cell, PLEASE LET ME KNOW IMMEDIATELY!! Landlines are not a possibility anymore in some areas. The phone service is completely digital. So thanks for this post. Metaverse doesn’t require a landline phone. I can give an update on Parameds. I worked there from November 2012 to July 2013. They now require your calls to be recorded and the software that allows that is not available for Mac (or at least it wasn’t as of July 2013). Also I believe (not 100% sure) but most of their WAH positions have been moved to a call center in NY. According to the email we received, that’s why a lot of us were let go. I only know of a few people who still have their WAH position and they have been there for awhile. Do any of these positions work on a brand new laptop? Or is a desktop required for every one? Probably most of them will require a desktop. I don’t see too many WAH phone support type jobs where a laptop is OK. The ones that are not phone support (like Pierce Eislen and Onpoint, Nextwave, etc.) *might* be OK with just a laptop. Just to let you know sutherland does not require a landline to work for them. Does anyone know of any WAH positions available to Californians? So many of them don’t hire workers from California? I was going through your list and Convergys does in fact require a land line and if you are working for certain clients, you will need to have the clients service. (ex-if client is Satellite provider, you need to have that service if it is technical support for client). Currently, Sitel does not require phone line and will provide the phone and other equipment once hired and onboarding is completed. Thanks, Trisha. I have had multiple people tell me that Convergys does not require a land line. Maybe it depends on the client? You may want to add Sitel to this list. I was just hired today and she told me that none of their projects require a landline now. Thank you for this info, Kassie! I wish Pleio would allow me to apply, but I only have a cell phone and Wifi . Hopefully, another company with a focused program will have work available soon. Blue) and pref Mac. Land line is ok as we don’t get cell around here either. I have been researching and many of the reputable companies want dsl. I work for Convergys and you do need to have a phone to log in the the Convergys desktop everyday. It can be a cell phone, but it has to be a separate phone outside of your computer. Is there anybody who worked in Lifebushido? This is very helpful Anna! Thanks for taking the time to do the research for this. I actually use Skype right now to make phone calls for business and stuff. Mostly because I can’t keep track of my cell phone anymore. My kids keep getting a hold of it and loosing it. When I worked for OnPoint their system was really easy! I can’t believe how quickly things change around here. When I first started working at home (5 years ago), services like Skype were still so unpredictable no one would allow them. Today, you may never notice the difference in service between voip and a land line. Yes!! It is completely crazy!! Yes times have changed because I love my Obitalk device. You cant tell if own landland or voip…Its wonderful and no phone bills, cant get any better than that…….